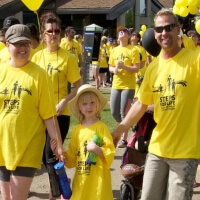 Steps for Life is a walk designed to bring people together who have a common goal: helping those who have suffered because of a workplace tragedy. Threads of Life is a national charity that provides support for family members who have lost a loved one due to a work-related incident, or a loved one has suffered a life-altering injury or illness at work. Annually the charity raises, much needed, funds for their programs through a community event called Steps for Life.